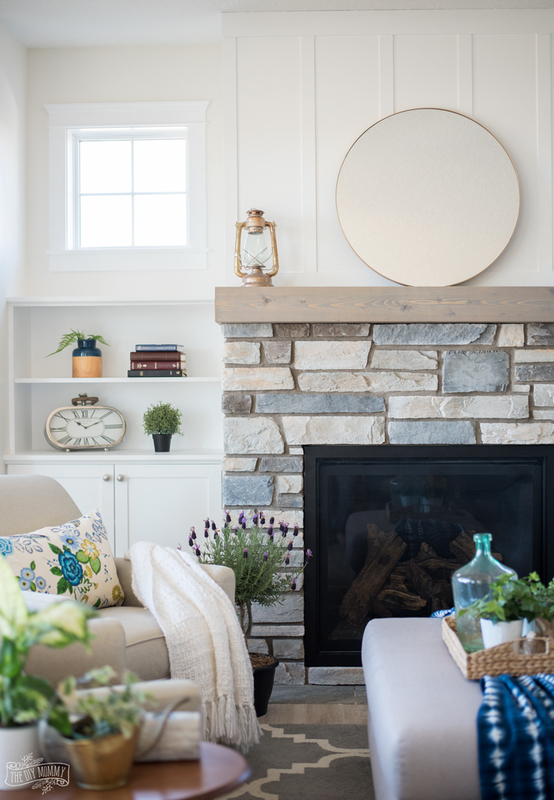 Come take a tour of my Mom’s Lake House newly finished living room, plus get some traditional coastal cottage living room decor ideas for yourself for Spring & Summer! My parents just finished their beautiful lake house living room, and is it ever gorgeous! 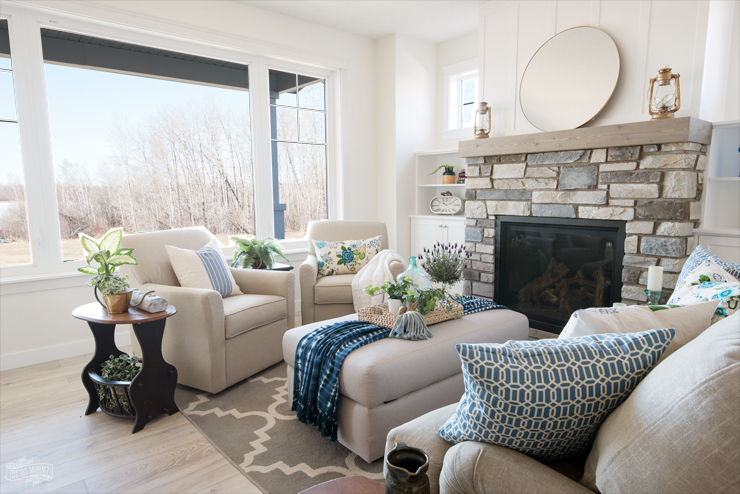 It has the perfect, traditional cottage details and I can picture us spending a lot of time here this summer. 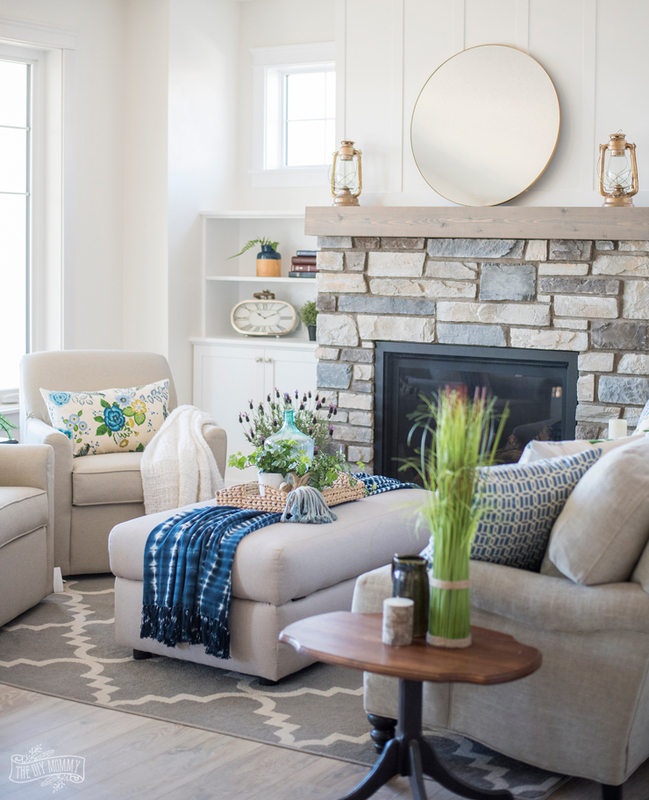 Let me give you a tour of their newly completed living room plus share some simple, coastal living room decor ideas that you can incorporate in your own home. 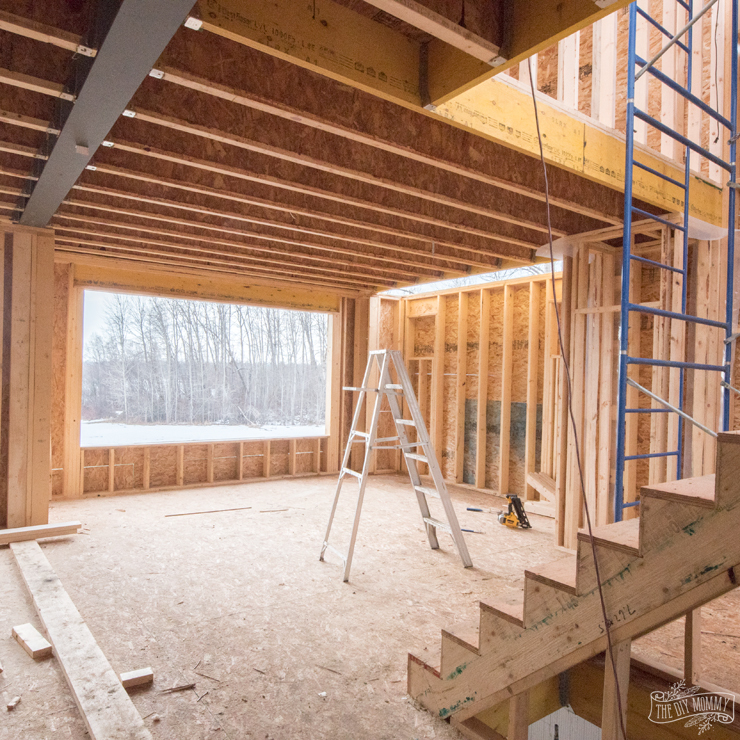 We helped my parents build their lake cottage, and since they’ve moved in this Spring, they’ve been working away at the finishing details on their own. They have done an incredible job! 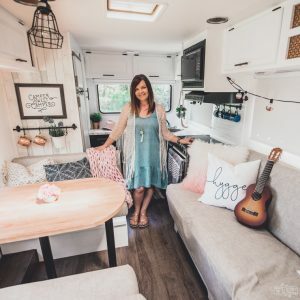 If you need to catch up on Mom’s Lake House project, you can find all of the posts about it right here. 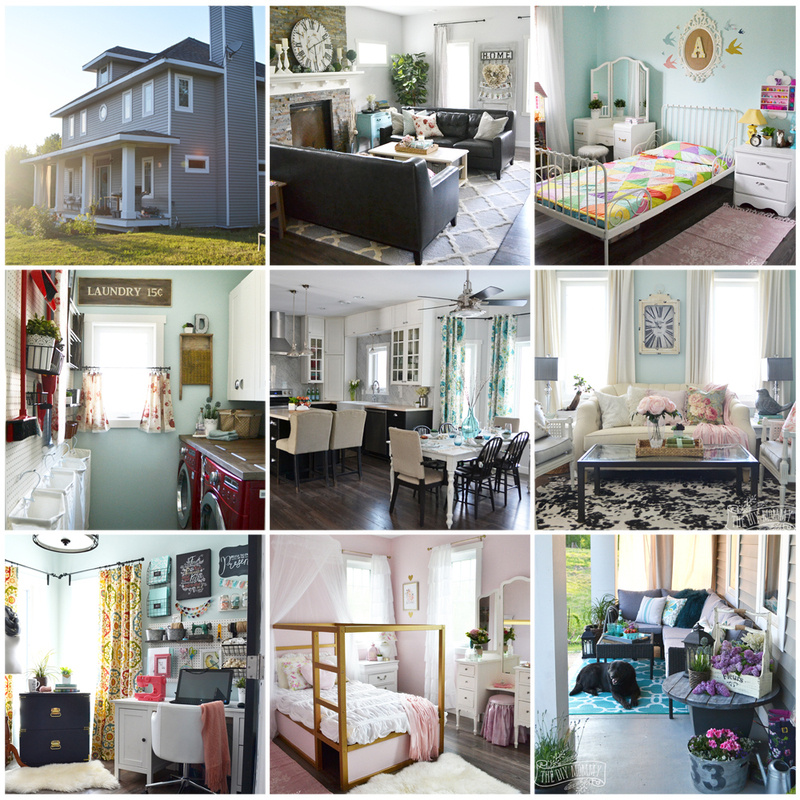 It’s been a long journey, and I’m so excited to be able to share another completed room in their new home with you today! The fabulous thing about this project is that I get to show you really dramatic before photos. Like, studs & plywood originals! Isn’t it stunning?! Mom & Dad built the board & batten part of the fireplace themselves, and then hired a fantastic mason to install the stone. It’s the perfect, rustic cottage look. Mom & Dad also built the side cupboards and bookshelves themselves for the ultimate use of space. Gigantic windows overlooking the lake fill this room with natural light and bounce off the walls (painted in Behr’s Swiss Coffee paint). 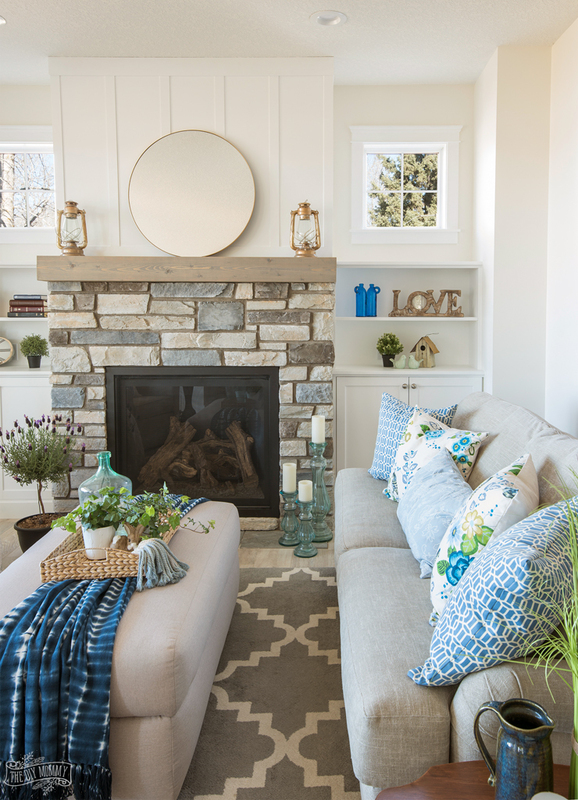 Neutral furniture is accented by bright pillows in coastal colours of blue & green. We decided to move this fabulous set of custom swivel chairs – the Designed2B Fabric Accent Swivel Chairs from The Brick – from my parents’ bedroom down to their living room to take advantage of the long summer nights. 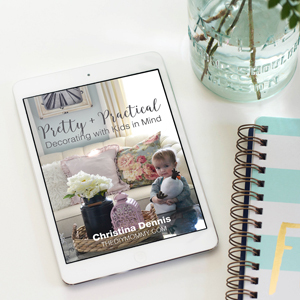 They’re the perfect pieces for looking out the window at the lake, and their neutral colour looks lovely in this room. If you head to The Brick in store, you can see all of the Designed2B furniture options as well as the custom fabric swatches you can choose to make them your own. It’s a great option if you’re looking for custom looking furniture shapes and colours for your home! Opposite the pair of chairs is a sofa that my parents built from scratch! They have mad DIY skills, and I’ll be happy if I even have an smidgen of their creativity and drive when I’m retired. At the center of the room is this extra large Designed2B Fabric Rectangular Storage Accent Ottoman from The Brick. My parents love the storage in this piece, and it’s also the same great neutral greige colour as the chairs. 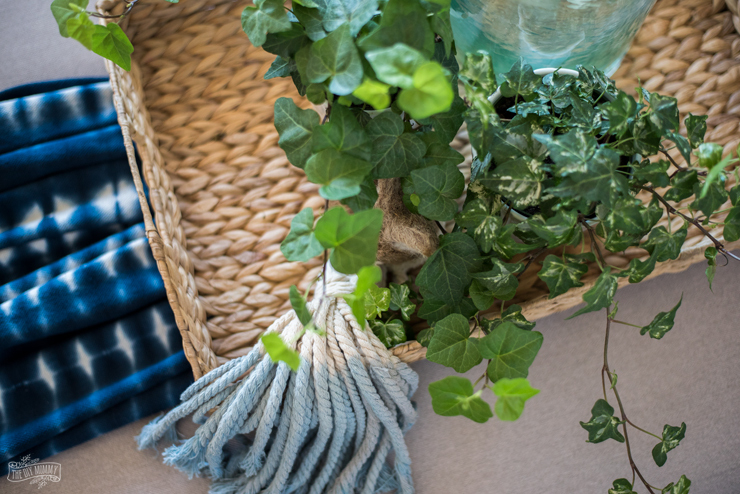 To dress it up for summer, I threw a casual blue throw and wicker tray on top of it for colour and texture. The Taza Area Rug works as a nice contrasting neutral & geometric element to the flowery & colourful pillows in the room. I also thought it would be fun to throw in pops of brass through accessories I found at The Brick like some brass lanterns I found in store and the gorgeous Oryx Mirror on the mantel. I’m really falling hard for this round mirror with the thin gold edge because it works in so many different spaces! 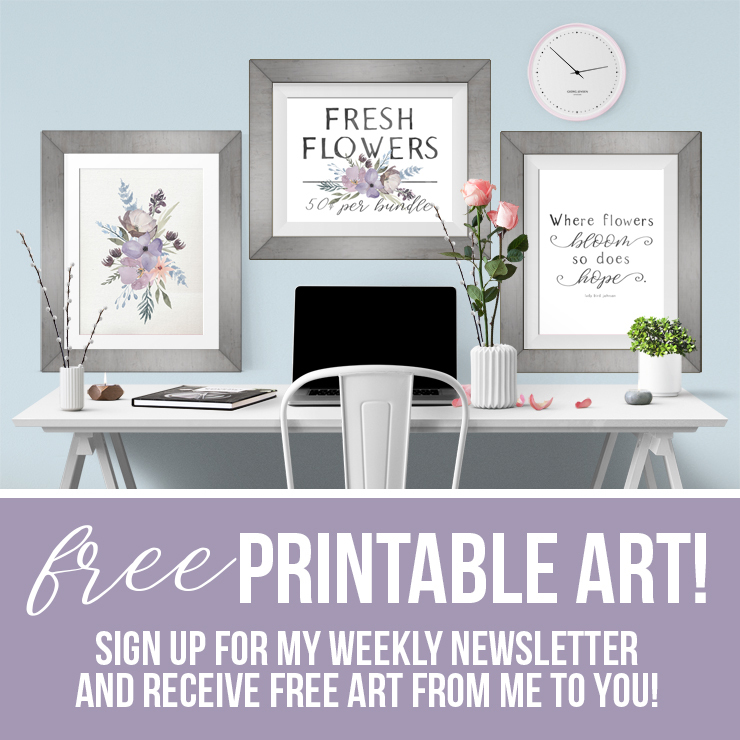 You can see it in my more boho styled studio here. 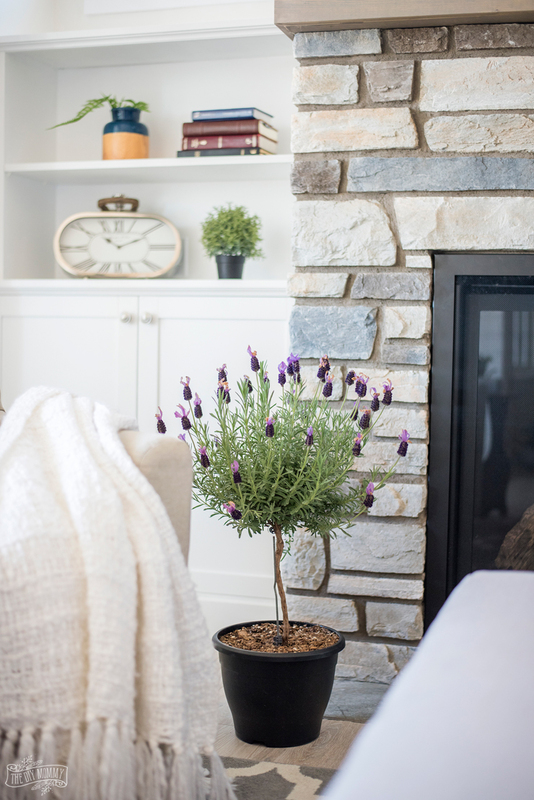 I finished styling the room with a whole lot of plants (faux and real, like this lavender topiary). Nothing says summer more than a whole lot of greenery! 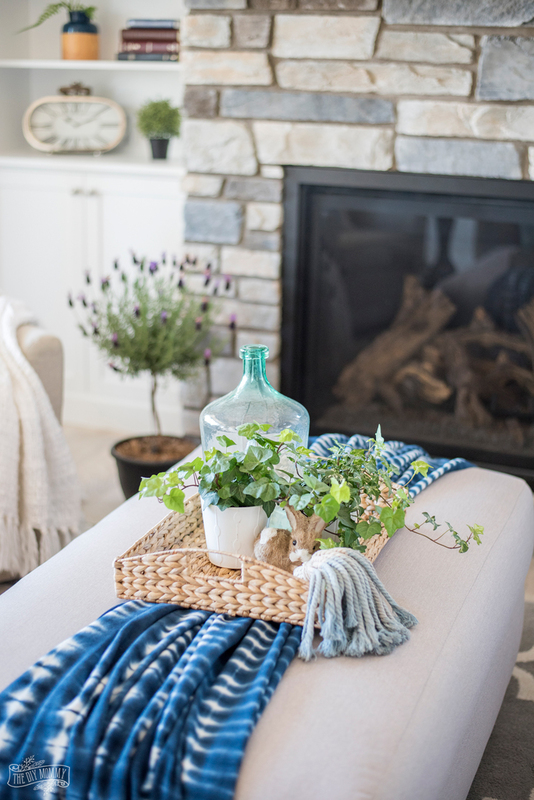 My parents living room is so beautiful with its traditional, cottage lines and I love that adding some summery greens and blues makes it fresh for Spring and Summer. Now tell me: What do you think of my Mom’s Lake House living room? It’s gorgeous. Such a pretty view too. So gorgeous! Your parents have mad skills! Can’t believe they made their own couch! Wow! Huge money saver there, I’m sure. 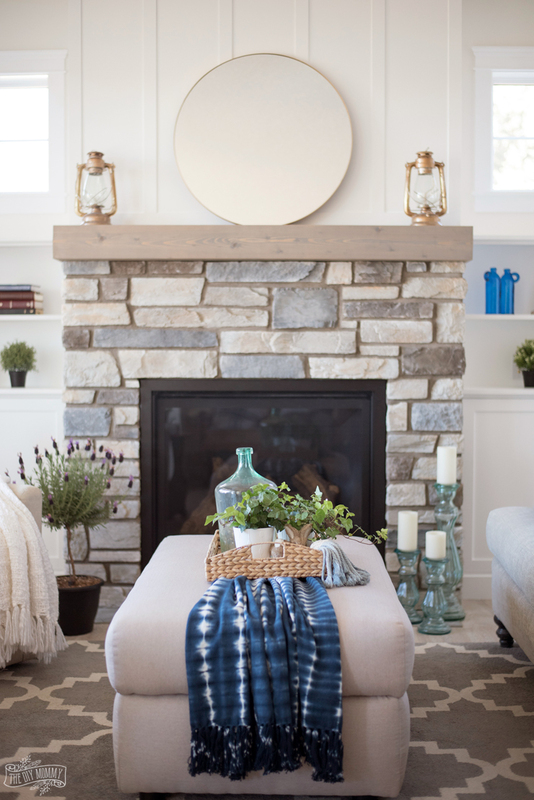 Love theoccasional blue stones in the fireplace. Thank you, Sheree. 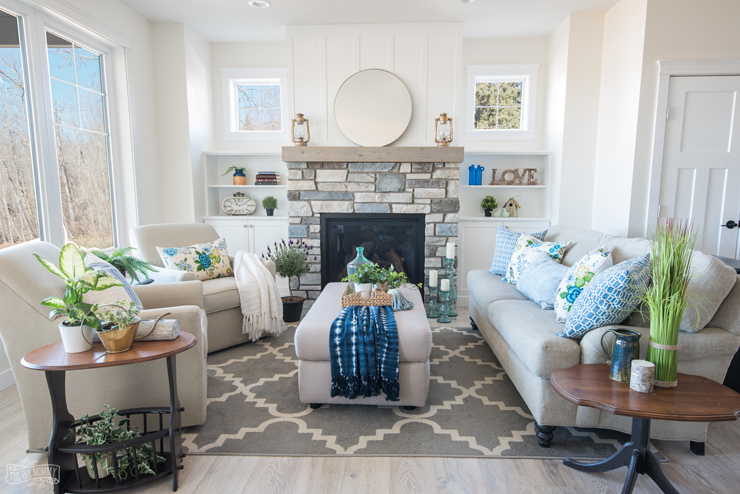 We couldnt agree more the fireplace just pulls everything together so beautifully. I love it and would love to have a living room like that one.